Liseberg in Gothenburg, Sweden - Amusement Park with roller coasters etc. Address: Liseberg, entrance from Örgrytevägen and from Södra Vägen. Season 2018: Summer season opens April 28. Halloween: in October. Christmas at Liseberg: mid Nov - Dec 30. (Opening hours). Liseberg is a fantastic place to visit both in the summer time and in December, the Christmas month at Liseberg. The attractions are many and for you who do not want to ride in any roller coaster, you can just walk around and look at the beautiful flower decorations and in the wintertime Liseberg is lit up with nearly 5 million lamps that are placed in the trees. When Gothenburg celebrated 300 years the area Liseberg opened. At this time you could take an aerial cableway from Götaplatsen over to Liseberg. 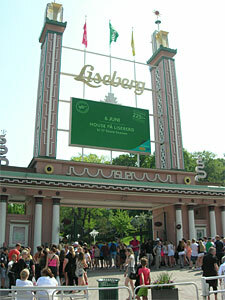 In 2013 Liseberg celebrated 90 years anniversary. Before Liseberg was built there have happend a lot at the area. At first there was only big land, pasture land for cows, horses and sheep. The city grow and everywhere more and more streets were created and the city traffic also increased. The rich poeple started to search for area at the country side again.... they wanted to come out to green area and plant their own vegetable garden. The area Liseberg then became as todays small plantation areas, they were split in to small areas who was called morgnings - the area was so big that you could harvest it during one morning. 1740 the district court judge took over the area, and his name was Jacob Bratt. The so called morgnings were still left and also the tobacco plant. Now the first buildnings started to be built at the area. This year (2018) comes a new roller-coaster Valkyria . Valkyria is Europe's longest dive coaster - a rollercoaster with a vertical drop of 50 meters. Just as you cross the edge, the ride is paused before falling into an underground tunnel. Short facts/Valkyria: Vertical drop of 50 meters, 47 meters high, 105 kilometers per hour, approximately 750 meters tall, 3 trains with 18 persons in each. This year (2017) you can test LOKE at Liseberg . Inside the Balder area you will find "Loke". It's a pendulum and twice as high as Spinrock was. It will be 27 meters high (the height of the gondola 42 meter) and has a maximum speed of 100 kilometers per hour. 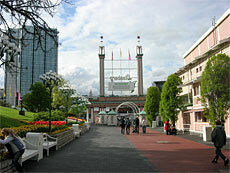 It is located inside a new area of the theme park. Next year (2018), "Valkyria" (new roller coaster) will be placed in the same place. The area will be approximately 8000 square meters and will be based on Nordic mythology. The area will also have new restaurants, shops and game areas. Short facts/Loke: 27 meter high, 100 kilometers per hour, the ride takes about 100 sec, 40 persons per ride. Lisebergs Gardens with AeroSpin, Flower Carousel & Children´s Paradise. (2016) there were three new attractions at the new area were Parishjulet were located. AeroSpin: 70 meters above sea level, you can control your own airplanes the way you want. Aero Spin is a 35-meter rotating tower with twelve arms and on each arm sits two aircraft. The aircraft has two levers, one for each wing, the person in the plain can then self-control the plane and get it to rotate sideways around its own axis. For the younger children there are a new imaginative playground "Children's Paradise" and the double-decker carousel "Flower Carousel". The old-fashioned "Virvelvinden" has also received a facelift. 2015 - new ride at Liseberg- MECHANICA. A unique attraction that has never before been seen at Liseberg. It takes you back to the Middle Ages and Leonardo Da Vinci's imaginative creations. Here you spin 360 degrees high up in the air (30 m), while going in a pendulum movement. Yes, it is a really strange machine .... something just for the daredevils :). Short facts: 30 m high. 6 gondolas with 5 seats in each. The ride takes approx 1,5 minutes. Why is it called Liseberg? After Jacob Bratts death the successful merchant Johan Anders Lamberg took over the area. Johan loved gardens and also his wife Elisabeth Söderberg. The word Liseberg comes from Johans wife, when Johan called her Lisa and gave the name to the area Lisas berg - eventually the name Liseberg. He also built a house for her, the so called - Landeriet. 2014 - New ride at Liseberg - HELIX "roller coaster"
The new "roller coaster" Helix opened in April 2014, it is the tallest and fastest roller coaster in Scandinavia. And maybe the best in the world! For those of you who like to hang upside down, there will be loops at seven different locations and you may also experience the so-called air time - a feeling of weightlessness. Some facts: 1381 meter long, the trip takes about 2 min and top speed is up to 62 mph. The trip starts where the cinema "Maxima" earlier was located and then go winding around the mountain. Helix has won the European Star Award in the category of Europe's best new attraction during the fair IAAPA Euro Attractions Show. In competition with 200 other new attractions in Europe Helix became the winner. During the first year 2014 1 million Liseberg guests has already travelled on Helix. 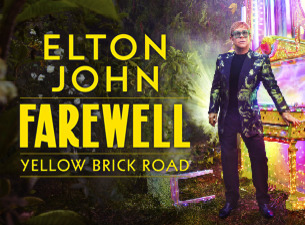 Next year, 2015, the fair will be held actually in Gothenburg on the Swedish Exhibition Centre, The Swedish Exhibition & Congress Centre next to Liseberg. Christmas at Liseberg started year 2000 and it has become a hugh success! Come here and eat gingerbreads and drink the Swedish speciality "glögg" and feel the Christmas feeling. 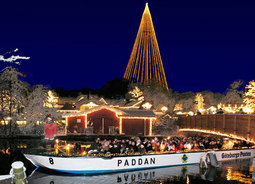 During Christmas time (mid Nov - Dec) you can go with the Paddan boat directly to Liseberg. A nice and cozy boat ride through a uplit Goteborg. Halloween started year 2015 at Liseberg. During one week in October Liseberg celebrates "trick or treat".